In the first of a two-part series on using impulse responses in Reaper's ReaVerb, we look at the basics: selecting, loading and editing. Read Part 2. At the heart of Reaper's ReaVerb plug-in sits a mighty convolution processor capable of combining your immaculately recorded tracks with the reverberant acoustics of famous concert halls, studio live rooms and more peculiar performance locations. (For further detail on convolution reverb, be sure to refer back to the article in Sound On Sound September 2010, available online at /sos/sep10/articles/convolution.htm). The impulse responses that drive this technology are available widely, free of charge on the Internet. In this first instalment, we'll look at selecting and using impulse responses within ReaVerb, as well as giving an introduction to the most useful features included for processing and editing the response itself. The first thing that strikes the user when opening up ReaVerb is the lack of bells and whistles. No impulse responses are included with the plug-in for emulating real spaces, and only two basic presets are provided that utilise the digital reverb synthesis capabilities of the plug-in. Far from this being considered a limitation, it encourages the intrepid Reaper enthusiast to go in search of impulse responses, or even record them. The Response Resources links in the box navigate to popular online impulse-response collections, and these range from real spaces to those that emulate the characteristics of digital reverb found on famous outboard units by Lexicon and Yamaha. Some trawling around will also reveal responses taken from more unusual equipment and environments, and these may serve as creative and original effects within a project. Usefully, a number of these web sites include examples of dry sounds being processed using the impulse responses offered, and this helps to simplify the selection process when browsing through the collections. Click the 'Add' button in the 'Impulse Response Generation' section. Select 'File' from the drop-down list. The echo diagram (waveform) of the impulse response is shown on the display (see picture 1). De-select the 'Attenuate impulse by -18.06dB' option after the file loads. If other impulse responses are stored in the same folder, you can switch between them using the drop-down menu just below the file path. The dry signal being fed into the plug-in is now convolved with the impulse response, hopefully resulting in a convincing reverb effect. Looking at picture 2, you'll notice that the plug-in shown is being used as a send effect. In this configuration, the Wet signal has been set to 0dB and the Dry signal is muted at –infinity. 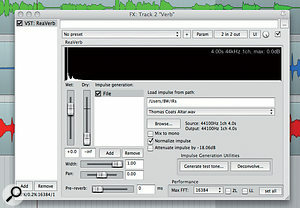 Alternatively, if applying the plug-in directly to a track, the Dry signal should be left constant and the Wet signal used to control the amount of reverb added. 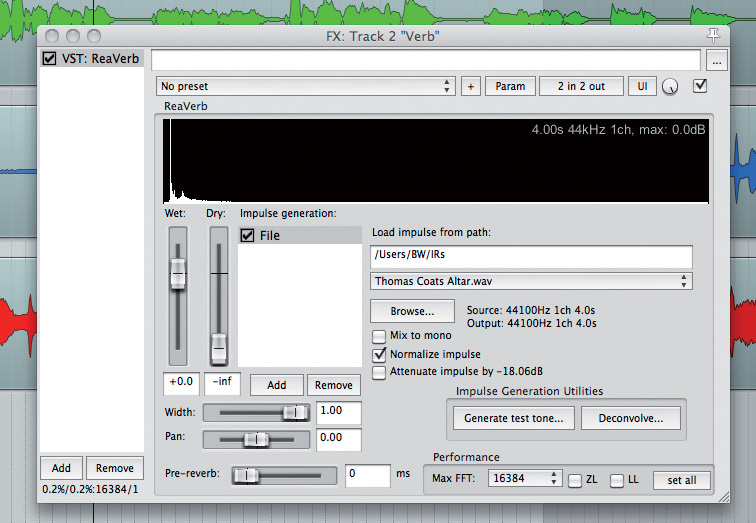 1: Loading an impulse response file into the ReaVerb plug-in. 2: The impulse response is loaded and its waveform shown. Peak level, length and sample rate are also detected and displayed in the plug-in window. Click the Add button in the Impulse Response Generation section. Select Trim/Gain/Stretch from the menu. Start pos: Adjusts the start position of the impulse response. This is useful for reducing the length of pre-delay on a large reverb or removing early reflections from the response for a less bright, dense reverb. The waveform in the display changes according to any adjustments made. Max len: Imposes a maximum length on the impulse response audio file. This can be used to trim responses that have silence at the end or for producing gated reverb effects. Stretch: Compresses or expands the impulse response. This can be used to shorten the reverb time while retaining the same tonal characteristics as the original response (for example, simulating an occupied performance venue) or to make the reverb time longer for creative effect. Pre-silence: Places additional silence at the beginning of an impulse response, increasing the pre-delay time of the reverb. A larger pre-delay helps to make the reverb more distinct from the dry signal, in turn helping to avoid the particular track being masked by other instruments in the mix. 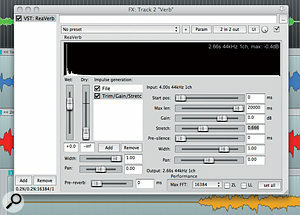 In the plug-in window shown in picture 3, the impulse response is compressed to two-thirds of its original length using the Stretch slider. The waveform graphics and information in the display change to reflect this, showing a recalculated reverb time of 2.66 seconds. 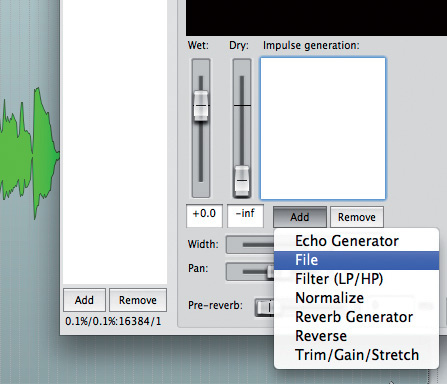 3: Using the Stretch parameter from the Trim/Gain/Stretch tools to compress the impulse response. The resultant change in length is reflected by the information display towards the top right-hand corner of the plug-in window. Another useful weapon in ReaVerb's impressive armoury is the low-/high-pass filter. When applied, the filter changes the tonal characteristics of the impulse-response file before the response is convolved with the unprocessed audio entering the plug-in. Such changes are reflected in the shape of the waveform displayed, and this is physically equivalent to making changes to the surfaces and structures within a reverberant room. Select Filter (LP/HP) from the menu. The low-pass filter would typically be employed to tame the overly bright response of a reverb: for a plate or a wooden room, for example. The cutoff frequency slider is adjusted and all frequencies above this point are progressively attenuated, resulting in a duller reverb effect. Larger acoustics, however, often feature more energy in the mid- and low-frequency ranges. Such a favourable 'bass balance' can work well on solo and acoustic source material, but can result in a more busy mix becoming muddy. A solution to this problem is illustrated in picture 4, with the high-pass filter being used to attenuate frequencies below 800Hz. This process thins out the reverb considerably, but without losing the impression of a large space. 4: Using the high-pass filter from the Filter (LP/HP) function to constrict the mid- and low-frequency range of the impulse response. Locating impulse responses and loading them into the ReaVerb plug-in are straightforward processes. The Trim/Gain/Stretch and filter tools offer comprehensive processing options — not always available on rival plug-ins — that greatly expand the palette of available effects. Careful adjustment of parameters is the key here, unless the user is heading towards more experimental reverb textures. Taking time to listen to the differences on headphones pays dividends, as subtleties of the reverb response may not be immediately apparent on studio monitors. In next month's instalment, we explore the techniques used to record impulse responses from scratch using ReaVerb, and the synthesis capabilities of the plug-in for producing natural and creative reverb effects. Read Part 2. Here's a selection of free impulse-response collections available online.